The Turf Books Accountants and Bookkeepers are the experts that specialize in the lawn care industry. With more than 20 years of lawn care industry experience, we know the ins and outs of the numbers you need to manage in order to be a profitable lawn care firm. The Turf Books team will work with you to help your lawn care business reach it’s highest growth potential. We don’t just manage “the books,” we are ACTIVE members of the industry! You can find us at many of the Lawn Care Industry events and trade shows. If you are attending, make sure to look and see if we are there! We are always willing to answer your questions! Dan Gordon of PCO Bookkeepers and Turf Books discusses the best practices for getting your business on the right financial track. 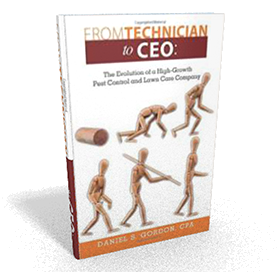 In addition, all proceeds from the sale of “From Technician to CEO”, will be donated to the Non-Profit Valerie’s House. “Signing up with Turf Books has be one of the best investments we have made in our business. Dan and his team were there when we needed them most, helping make our transition from our old accountant and bookkeeper to Turf Books quick and seamless. Our old accountant would always ask me “how did you do this month”, Turf Books tells me how we are doing, and how our numbers stack up against the rest of the industry. “Dan Gordon and Turf Books have helped take my business to a new level with a focus on improving accounting, operations and financial management. If you are looking for one of the finest service providers in the industry, get Turf Books on your team. Build Your Lawn Care Business: Set ambitious goals for yourself and your business. Raising the bar will give your team an objective to shoot for. The lawn care industry is a very competitive space to work in – especially when businesses are within close geographical range to one another. It’s a constant battle and you want to know what you’re up against. Who’s taking your share of the market? Or better yet, who’s market share do you seek to gain? The PCO Bookkeepers & Turf Books family are proud to announce that Brian Post has officially received his CPA License! Over the last 6 years, Brian has lead by example to ensure our growing team continues its pursuit of excellence. Congrats Brian!